Hope that everyone enjoyed a long and pleasurable weekend over the 4th. Weather has been nice here for our Fort Lauderdale fishing charters with plenty of sun and only some scattered showers as we fish offshore. 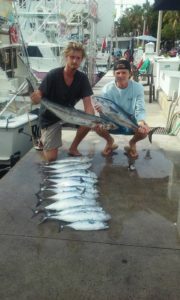 The fishing has been decent but has slowed on some days as in comparison to the previous report. 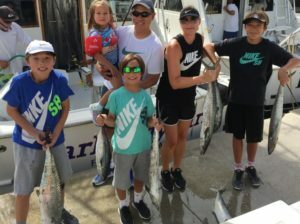 We have caught fish on all charters and had some good catches, but experienced a slower bite right around the 1st of the month. Back to good action this morning for two fathers and their sons (Rob & son Jacob aged 14 and Kevin and his son Ryan aged 11)with a nice Sailfish along with a good mixed bag of different species (4 Kingfish, a Tuna, numerous Bonito and probably 10 summertime Barracudas) with Capt Matt along the reef line withiin one and a half miles from shore with the exception of the Sailfish which took a trolled strip bait out in 700 feet. So strong action close to shore as a 1st thing deeper water out the inlet search for Mahi-Mahi was tough and did not produce which has not been unusual with smaller Mahi being the norm, and that is when you can find them. There are Mahi-Mahi offshore but a full day commitment is certainly best for locating them. Always a chance for a bigger fish this time of year but the small schoolies as we said are the size now, and once again that is when you can find them. Quite scattered but good numbers in the school for these borderline legal fish. 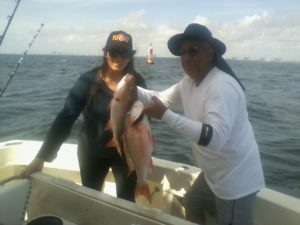 We have had success fishing the bottom with some nice Mutton Snappers when the current allows. This is fun hands on fishing for our anglers on spinning rods using small sized live baits. 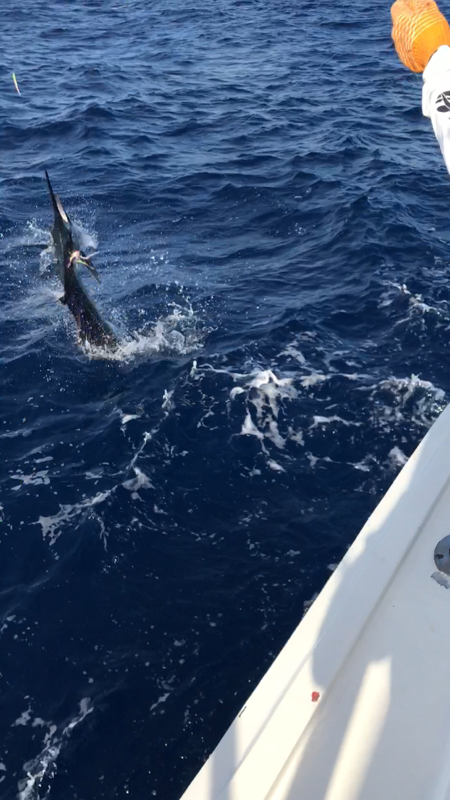 We had a strictly light tackle charter this week and the Bonito provided steady high horsepower action on those same spinning rods for that half day trip. All action with the exception of Mahi-Mahi has been basically well inside of 200 feet, and that includes the snappers as well. 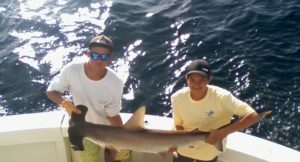 Good success pitching baits to tailing Hammerheads, you choose the tackle.